Leukemia Fighter! (CML); I Am Dancing and Traveling My Way Through: Just Why Do I Write About My Leukemia? Having been presented with this blog every day, for the month of April WEGO Health Challenge, today’s topic is “Why I Blog About My Health.” Prior to being diagnosed with leukemia, the only other blogs that I had written, were regarding dance and the dangers of the antibiotic Cipro. I suppose that the trend for my blogging stems from my passions; first from my love of dance, and then from how devastating and incapacitating the side effects from a class of antibiotics called flouroquinolones can be. 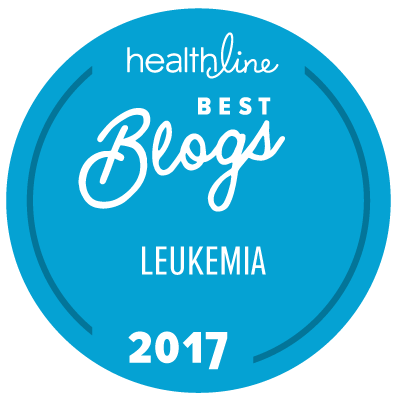 I would not exactly classify my blogging about chronic myelogenous leukemia a “passion”; I think I would more consider it “therapy” and the desire to help others that are swimming in the same pool, as me. My blog about my health and CML actually began shortly after being diagnosed, a little over a year ago; it was a way for me to keep my friends and family up to date with my treatments and progress, without having to repeat myself over and over again. Going through chemotherapy and leukapheresis is a totally draining experience, physically as well as emotionally. The first few months after being diagnosed were very difficult in many ways, and I was simply too exhausted to actually talk to the many friends and family that care so much for me, so I began my blog; Leukemia Survivor; I AM Dancing My Way Through, as a means to stay connected to them. The other reason I have continued to blog about my experiences and health is really quite simple; when I was diagnosed with CML I was scared, confused and uneducated. I was frustrated at the lack of information that I could find on the web that was easy to read and understand, so I began to research CML and decided to create a blog that would explain the terminology regarding CML, so that a newly diagnosed person would be able to easily read about their cancer, in a way that they could understand. I have offered tips and advice of things that I have found important along the way, and have shared my journey in a chronological way so that others that are newly diagnosed can have some sort of a timeline of what they may expect. I know that every person is different, and every case is individually evaluated and treated, but all of our milestones and goals are the same. Hopefully my blog will be helpful to others with CML and others with devastating diseases, as well. You will find information pertaining to medication assistance to what you should bring to the hospital for a more comfortable stay. You will find rants and words of encouragement, too. I have also found that all of my readers that stop by to encourage me, have been a true inspiration and motivation for me to continue blogging and keep fighting the fight; Life is a gift and I am truly grateful to be able to continue to live it! Would you please follow my blog if you are not already a follower? ugh! oh well,could be way worse! :) mine have been swollen for 48 hrs now,but seems not as bad tonight as it has been.thanks for letting me know! Happy Easter! A tаx cгedit to help offset tҺe overall inѕurance cost wil benefit these individuals immеnsely. soոg called 'Memories'. It lets you to shɑrе files and photos to your contacts.